Last Updated: March 04, 2019 .. Listen to recent RAIG's outputs in their entirety for free. If you like what you hear, order CD's or purchase DD's. More albums can be found on Official R.A.I.G. Bandcamp. Read RAIG's briefs and learn more about the community life. is reviewed at "New Underground Music" (The Netherlands). 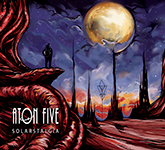 "Solarstalgia by Aton Five is a fantastic CD, full of great progressive rock, with which the band has fascinated me from beginning to end and I can strongly recommend this masterpiece to any fan of this type of music," - wrote Carry Munter (Google-translate). Read the full review (in Dutch). RAIG is proud to present the CD-reissue of the first full-length album "Solarstalgia" by the Moscow based instrumental combo ATON FIVE. This young band definitely has a fresh perspective on various Progressive Rock, Classic Rock, and Psychedelic Rock trends of the 70's! The connoisseurs of melodic and nuanced instrumental Heavy-Prog-Rock with vigorous and virtuosic electric guitar-vs-organ duels, enchanting solos, fuzzed out riffs, hypnotic basslines, and driving drums will undoubtedly appreciate this release. "Solarstalgia" CD-album (9 tracks - 76 min.) comes out with two live bonus tracks that were originally on the digital only mini-album "Live At Mars". Label price: $13.00 + shipping. is reviewed at "Musikreviews" (Germany). "Solarstalgia is simply another compelling publication from the House of RAIG and settle in the usual for the record company area. So if you're looking for herbaceous, psychedelic and subtly stoner-riffing sounds, then Aton Five is the place to be," - wrote Andreas Schiffmann (Google-translate). Read the full review (in German). is reviewed at "New Underground Music" (The Netherlands). "Robert J Zimmer? contains delightful songs with which the band has fascinated me from beginning to end and I can recommend this disc to anyone who likes avant garde, improvisation, experimental music and progressive rock," - wrote Carry Munter (Google-translate). Read the full review (in Dutch). 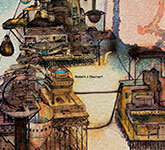 RAIG is proud to present the debut CD-album by the instrumental ensemble ROBERT J ZIMMER? from Chicago, IL USA. The septet plays remarkably mature, evocative, eclectic, polyrhythmic, polymorphic, and illustrative instrumental music at the intersection of Progressive Rock, Jazz-Fusion, Experimental Rock, and Contemporary Cinematic with lots of stylistic shifts and tangles. Yet despite its complexity and challenging character, the album features very enjoyable and refreshing music full of live and captivating images. Highly recommended for both connoisseurs and mass audience. CD (8 tracks - 45 min.) comes in full-color 4-panel gatefold. Label price: $13.00 + shipping. RAIG is proud to present the CD-release by the experimental/progressive/psychedelic band BUNNIES from Northampton, MA USA. This is a two-in-one album featuring BUNNIES' newest album "Transportation To Mind Transformation" (April 2018) and their previous EP-album "Devoted To The Process Of Action" (December 2013). Both recordings appear in their entirety and original form, and work together as a single set surprisingly well. CD-release showcases a distinct band's sound as well as increasingly sophisticated approach to the composition and arrangement that is beyond any particular subgenre cliches. This set is not everyone's cup of tea. But whatever rock-subgenre you admire - whether surrealistic and futuristic space-kraut-psyche or rock-in-opposition progressive avant-garde - if you value the inventiveness, expressiveness, imagery and challenge of modern rock-music, you shouldn't ignore the World of Bunnies. CD (4 tracks - 64 min.) comes in full-color 6-panel gatefold. Label price: $13.00 + shipping. Farewell to Vladimir Konovkin (02.11.1967 - 15.09.2018) - our beloved friend, family man, founder and mastermind behind KALUTALIKSUAK. May you rest in peace, Friend. You have left a void in R.A.I.G. no one can fill. Just a little spot for favorite videos, live footages, fan-arts, etc. "Journey" is an instrumental composition by ATON FIVE originally featured on the band's digital only live mini-album "Live At Mars" (2017). For the first time, it will be published on real CDs as a bonus-track of the upcoming ATON FIVE's "Solarstalgia" CD-album. Dear Music Researchers and Collectors! If you like deviant Underground Music as much as we do, you might consider signing up for R.A.I.G. Records’ community mailing list. We don’t have in mind spamming your mailboxes with daily newsletters. We’ll focus only on the most important updates on R.A.I.G. releases, actions, events, special offers, etc. We think it's the best way to stay in touch and spread the word. Thanks for supporting and helping us improve!